For the past 57 years, the U.S. Department of Homeland Security, the United States Coast Guard, and the Office of Auxiliary and Boating Safety have published a report that contains statistics about recreational boating accidents. The 2015 report was just published and the bad numbers are up across the board. In a nutshell, the Coast Guard recorded 4,158 accidents that involved 626 deaths, 2,613 injuries and approximately $42 million dollars of damage to property as a result of recreational boating accidents in 2015. Those figures involved vessels of all types. 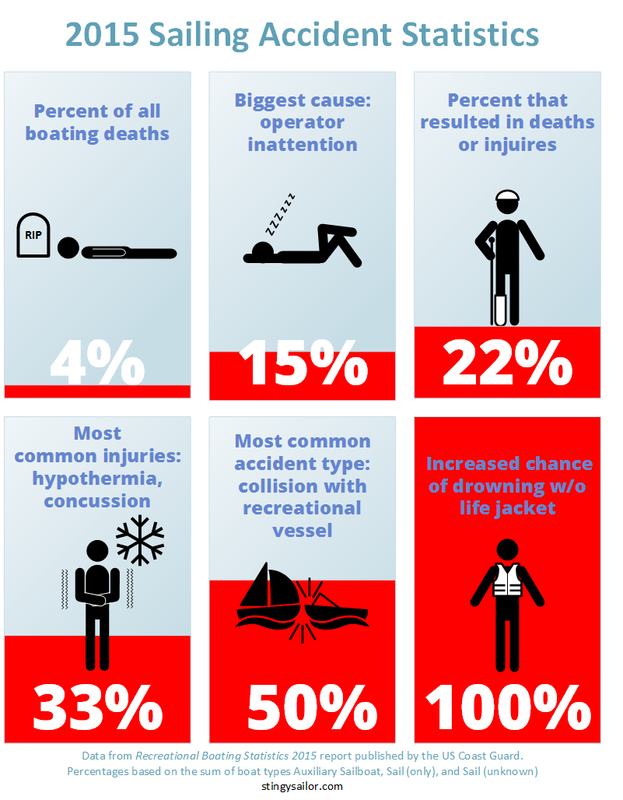 You’re as likely to have an accident with another boat as anything else. Don’t assume the other guy will do the right thing. Everyone should wear a personal floatation device to cut their risk of drowning in half. Be smart, not stubborn. You may freely distribute this poster anywhere you want without my permission. In fact, PLEASE DO. Put it on your club’s website, post it on your Facebook page, print it out and pin it up on your marina’s bulletin board, wherever. To make it even easier, I’ve added a printable PDF file to my Downloads page for the subscribers of this blog. Want to subscribe? Read on. Let’s all help raise awareness about sailing safety and let’s start onboard our own sailboats. Excellent info we should pay attention to.